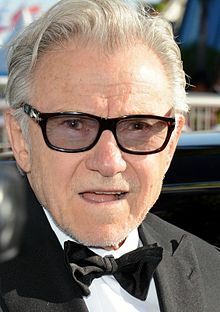 Brooklyn, New York Ceety, U.S.
Harvey Keitel (/kaɪˈtɛl/ ky-TEL; born Mey 13, 1939) is an American actor an producer. An Oscar an Gowden Globe Award nominee, he haes appeared in films such as Martin Scorsese's Mean Streets an Taxi Driver, Ridley Scott's The Duellists an Thelma & Louise, Quentin Tarantino's Reservoir Dogs an Pulp Fiction, Jane Campion's The Piano, Abel Ferrara's Bad Lieutenant, Robert Rodriguez's From Dusk till Dawn, James Mangold's Cop Land, an National Treasure an its sequel, National Treasure: Book of Secrets. ↑ "Person details for Harvey Kutel". familyserarch.org. Retrieved December 27, 2014. This page wis last eeditit on 22 Dizember 2015, at 02:15.